You can also get the DVD as a set of downloads at an even cheaper price - 35% off when buying all the downloads at the same time. 12 unique exercises to help you master Travis picking – great for hymns! Tricks for playing any open chord in B without barre chords or capo! Play barre chords without the pain! Totally different material to that contained in Musicademy’s other intermediate guitar course. Worship leaders and acoustic guitar players need to be wary of a major illness that can infect their playing. This malady is called complacency. It comes to rest all too often on rhythm acoustic guitar players, especially worship leaders. But fortunately there is a cure. And it comes in a nice, low calorie package. 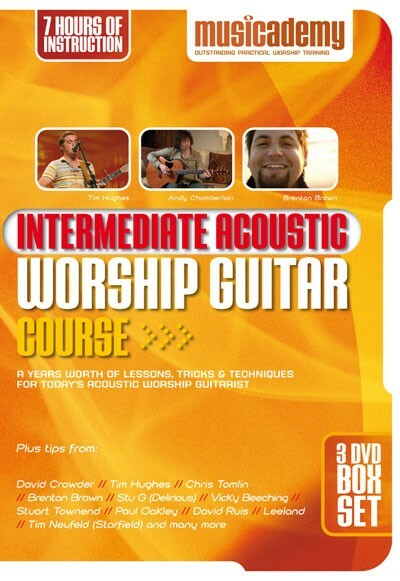 It is "Intermediate Acoustic Worship Guitar". When I began watching this DVD set to help understand what it was, I quickly realized this was more than a 1 hour DVD with a few "tricks and tips". Instead, "Intermediate Acoustic Worship Guitar" is a complete, and fully featured 7 hour course that will revamp and energize your acoustic guitar skills. This is a resource that is meant for rhythm players, and especially worship leaders. In fact, much of the items covered in the course, targets common applications for worship leaders such as fresh strumming patterns for common worship song rhythms. But the DVD's do not get you bogged down into bastions of skill sets for long periods of time. Instead, like other Musicademy products, this course flows from point to point and interjects interviews, quick tips and concepts that apply to the lessons being learned. This is a true course, not just a terse summary of best ideas from a guitar guru. But because it is broken into several lessons, this DVD could be used as a weekly teacher. Plug it in for 30 -40 minutes, work through a few lessons. Then work on that for a week. Come back in a week and roll through a couple more lessons. This DVD set works well as a self-paced course that will propel a rhythm acoustic guitar player. The amount of content in the DVD set is so voluminous, you may not believe it- it is over 7 hours (yes, I said seven) of digital video content, across 3 DVDs. The content starts head-on with strumming and moves through that extensively. All the while, the instruction compliments both single instrument and band contexts. In fact, worship leaders will especially appreciate the regular tips explaining how to apply concepts and skills in the worship team/band settings. Most of the strumming patterns actually accompany a drum click pattern that helps the player understand the rhythm context for their strumming patterns being learned. 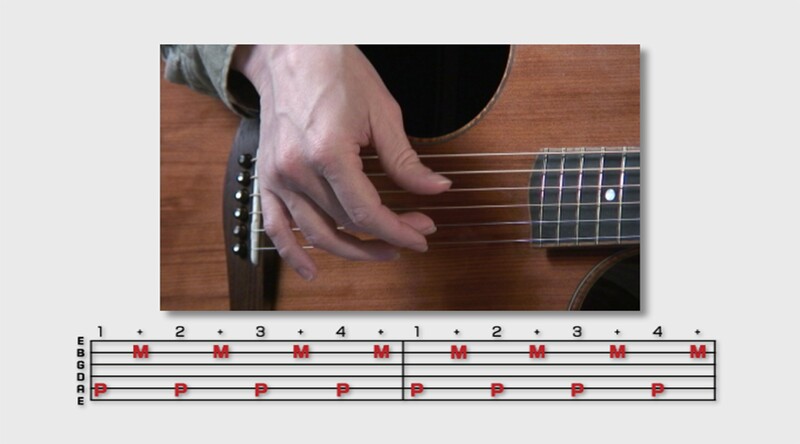 Topics move on to chord voicings, complex chords, barre chords and picking techniques. Even included are specific flourishes/licks that an acoustic guitarist can learn and put in their toolkit for appropriate settings/use. At first, the DVDs don't tackle classical music terms and foundations (other than timing), but as you work through the course, you learn keys, notes and timing, even Nashville Number system information. All of this would be far too much information, if the course was not well segmented, nicely paced and easy to watch and take at your pace. While this course is definitely not for the beginning guitar player, it is going to be very effective for those who play well enough to lead worship in a local church context. It will help take those people into an entire new strata of expression on their guitars, by providing very methodical, though engaging, lessons to invigorate their playing. The details about this course are much rather seen than read, so I highly encourage you to view the important video demo that is linked to from this page. The bottom line- if you are a worship leader, or know a worship leader, this course is a beautiful tool that will help you and work for you in your local church bad context. If you are an acoustic player looking for a sure-fire resource to move you along to the next level- this is it! 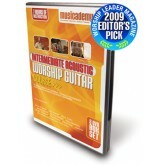 I highly encourage you to consider the Musicademy: Intermediate Acoustic Worship Guitar resource. Acoustic guitar players who have reached a threshold in their playing. Typically competent players can play through most worship songs but use the same old chords and strumming patterns. How is it different from Musicademy's other Intermediate Guitar DVDs? 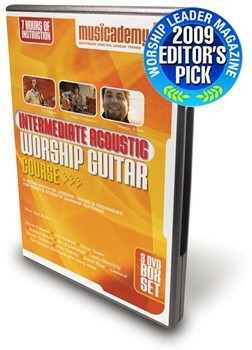 Here is a detailed article describing the differences between the three Intermediate Worship Guitar DVDs. I've been using Musicademy products for many years now, and remember waiting for the first BackingBand player. I have used a few of their DVD courses for guitar and but when they released the Intermediate Acoustic Course I was really pleased as Acoustic is my prime instrument. Though I completed the course a while ago, I still go back through bits now and then to refresh myself, and after a recent hiatus of 18 months due to illness, I have just decided to use it to help myself back into playing at church again. The course is well structured, the lessons easy to fit into any spare hour giving time to go through a few times and practicing. It has really helped me to develop my playing and giving me lots of tools for my toolbox. So thank you Musicadamey for this and all the great products you produce to help us as worship musicians. May God Bless you in all the work you do. Big Thumbs Up!!!! Good step by step approach, good photography, I can follow what been taught, with some practicable advice, from what I've seen in the demo video it seems like a solid product. Now the next question your going to ask me is when are you going to bite the bullet and try it out? Put it this way, when I buy one DVD and like it, I'll buy more. This product is a great value for a lot of teaching, which would cost much more in private lessons. The lessons are thorough, and take you from one level of difficulty to the next. If you need to move to the next level this DVD series will help you do that. The intermediate acoustic guitar dvds are a very complete product. Every lesson is simply broken down into helpful blocks enabling you to go away and practice each block before moving to the next one. There are helpful camera angles to let you see easily what is going on, in terms of strumming and where fingers are on the fret board. The range of topics covered is broad without being lightweight in the attention brought to each one. Everything is looked at from fingerpicking to strumming from barre chords to playing with 10ths and 6ths. This is a great product if you're a competent player who feels stuck in a rut; always using the same strumming patterns and chords. New strum patterns and chord inversions and taught in an easy to pick up way and then often applied directly to an example song enabling you to put them into practice. 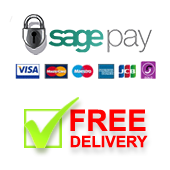 All in all a very well rounded product which considering how much you would pay for the equivalent amount of lessons extremely good value. You can always re-watch them too! Our worship group is blessed with several acoustic guitarists yet one of the challenges we have is varying the playing styles so that all the guitars are not doing the exact same thing. This instruction was extremely helpful -- providing ideas on how to create more "texture" of sound among the instruments. In particular, I found the sections on add9, 5ths, 6ths and 10ths to be especially interesting and helpful. A must have instructional asset! I've worked through most of the DVD lessons, and am now going over them again to get them into regular practice. The presentation is excellent, the navigation is good and the teaching is great. The lessons are simple and effective - Andy's style is engaging and the use of 'sitting on the sofa with an iPod makes it feel relaxed, less impersonal than might be expected from a DVD course. I'd recommend these DVDs to any acoustic-guitar based worship leader, and I'm encouraging the other musicians in our worship group to look into the comparable ones for their instruments. I very much appreciate this course as much for the spiritual quality as for the music training. Sprinkled with insightful tips from experienced worship leaders, the material in this course will save people a lot of time to progress in their musical ministry. It covers a broad range called "intermediate". If one has the basic open position chords down and senses an anointing to lead worship then this set can be a super next step. Andy Chamberlain teaches many different chord voicings, licks, and some basic, very helpful, music theory, which will better equip the guitar playing worshiper for the ministry. It is also great for people who have been doing this for years as there is so much material that there is something here for everybody to learn. This fills a gap because it can be hard to find teachers that understand what we are trying to do as music ministers.